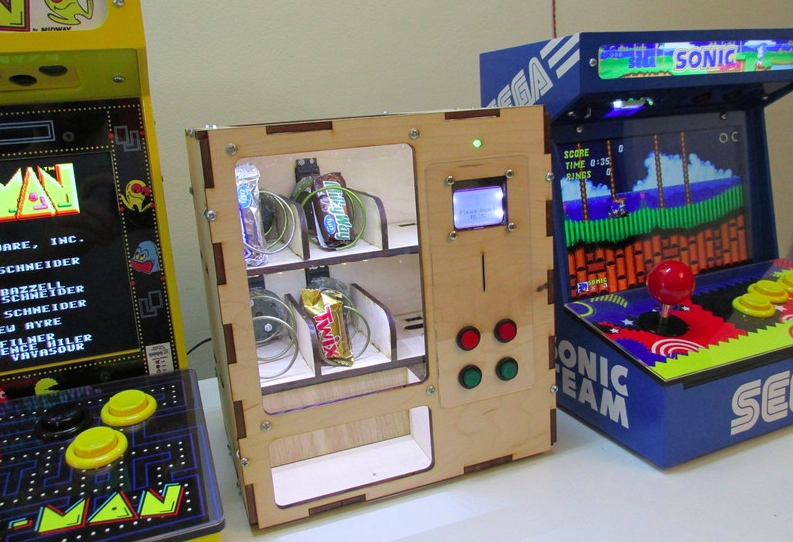 Ryan Bates has built a miniaturized vending machine from scratch using an Arduino Uno, four continuous rotation servos, and a Nokia 5110 LCD. The device, dubbed “Venduino,” includes four input buttons to make a selection, an LED indicator, and a 12V light strips to illuminate the inside of the cabinet. Whether it’s candies, toiletries, game cartridges, or miscellaneous items you’re looking to dispense, the possibilities are endless. Simply insert a coin, choose a product, and repeat. Sound like something you’d like in your dorm room or cubicle? Bates has shared his code and schematics, and provided a detailed breakdown of his build below.